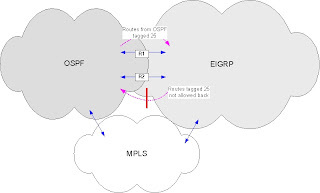 In part 1 and part 2 of the post, we mainly focused on OSPF and EIGRP mutual redistribution. We use administrative distance to control preference, and use tags to prevent loops. In a typical enterprise WAN environment, carrier MPLS can also be used to carry traffic between sites and data centers. In a resilient architecture, there are multiple paths to the same destination. The business requirement may be such that certain traffic should take one type of link as its primary path, while still having a backup path in case of failure. 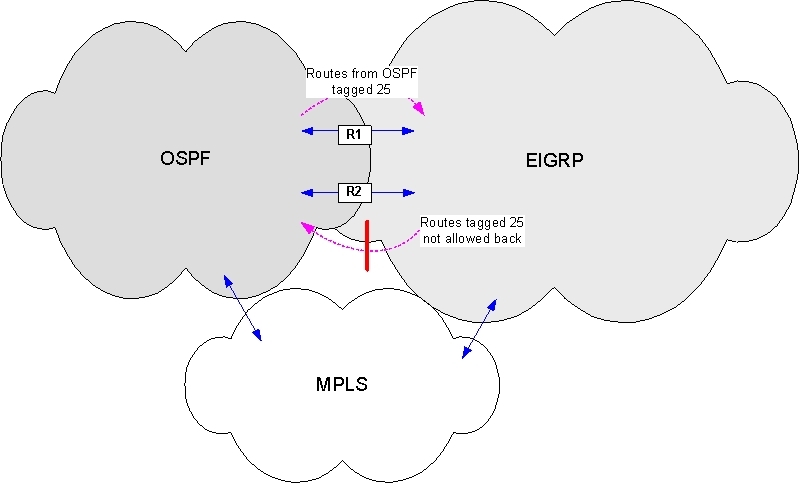 In the illustration, MPLS provides the WAN backup path for direct facilities (OSPF-EIGRP). BGP is used as the dynamic routing protocol through the MPLS cloud. Recall from part 2, tag 25 is used to indicate routes originated in OSPF, and prevented from feed back from EIGRP back to OSPF. Why is there a third issue with BGP? 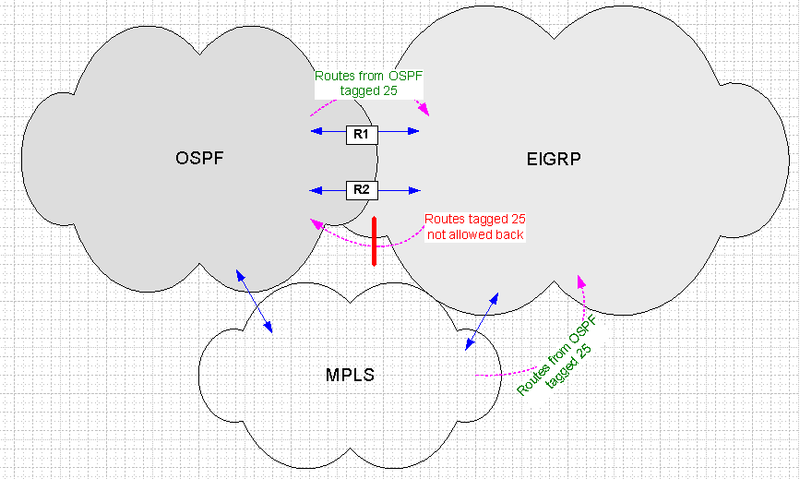 Because the same route is advertised out of OSPF to MPLS via BGP. 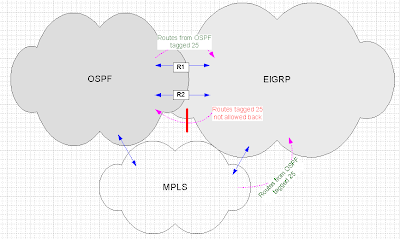 The data center running EIGRP will also learn the same route from MPLS cloud as a BGP route, in this case not tagged. 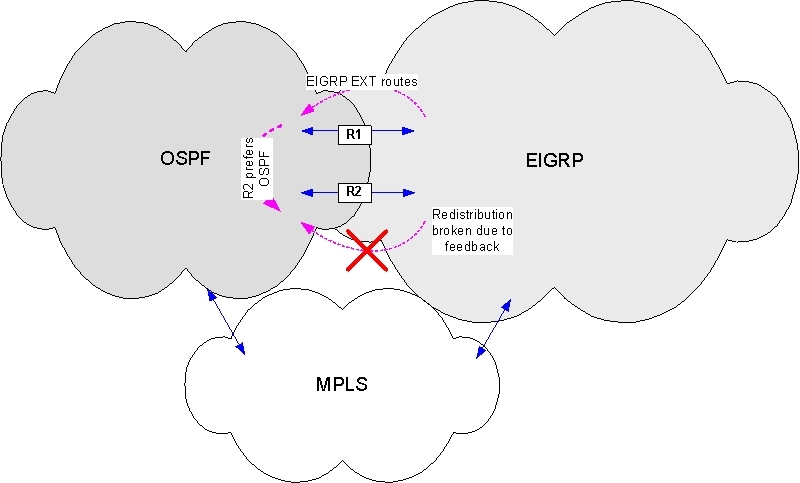 On EIGRP to OSPF redistribution point, the tag filter does not stop feedback from a route learned via BGP. As long as east coast has a feasible successor (one with metric lower than current best FD), then this route will be advertised to west coast, with EIGRP distance of 100, thus preventing redistribution. This is an example of network with the feedback issue. Note update tagged “1979” is sent due to better next hop FD. The end result is a network originated from west coast advertised out MPLS, became advertised back from east coast back on EIGRP, and preventing desired redistribution from OSPF into EIGRP. The fix is by also setting tag (25) from routes coming from the west coast data center (identified by originating AS number) on the redistribution point from BGP to EIGRP. 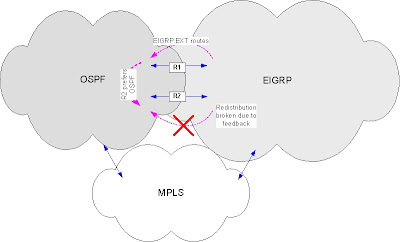 These tagged routes can be prevented from “feedback” on the EIGRP link with a route map. The route map can be applied on EIGRP interface distribute-list. This is the first part of a series to explore, regarding optimizing enterprise Internet applications. I estimated that on average, I use Google at least a dozen times on an average work day. I don’t think I will be far off to say that it is the top Internet application in almost every enterprise. While writing this article, I searched a couple of key words and arrived at a few web sites to find the specific information I was looking for. I did not have any books or references with me. More often, business users expect information on demand. It is often faster to get the information on the Internet than finding on the hard drive, and sometimes more accurate than asking your buddies. Why this matters? Google is just an example here. For an Internet application that triggers millions of transactions almost every day in your enterprise, it is worthwhile to look “into the cloud”, and understand how your enterprise is interconnected to the rest of the world. Google’s primary AS is 15169. It originates more than a hundred IPv4 prefixes for common apps, such as www.google.com. So how are you connected to AS15169? The average AS path length from Google is almost 3. But if you share one of the ISPs that Google peer directly with, then your path will be shorter. As an example, check the internet routing table to see how you reach IP address for Google.com. The second shorter path (through a tier one ISP) will always be preferred over the first one. The significance goes beyond the length of the path or how many ISPs to transit through. Larger ISPs are becoming content providers in order to further optimize performance. Just a few days ago, Level 3 signed a deal with Netflix to “support storage for the entire Netflix library of content”. Level 3 has become the primary content network for Netflix, while Akamai and Limelight remain as partners. In this case, if your users are in the entertainment business, you will be at significant advantage by peering directly with Level 3. There are more considerations, inbound vs outbound, streaming, CDN, geographical, international, resilience and cost… more to follow. Juniper SRX integrates firewall features with full routing capabilities. In a network architecture where there are increasing demand for security segmentation and stateful firewall inspection within the network, multi-vender routing interaction may become necessary. Risks and complexity exist with a mixed vendor environment, even when both sides support standard protocols. Here is such an example. To establish BGP neighbor relationship, both sides need to agree on timer values. RFC4271 defines the characteristics of the timer, but does not specify value for keepalive and hold time. BGP uses keepalive timers to monitor established connections. If for a period of time that exceeds hold time, BGP considers the neighbor connection down. Note the hold time is always three times the keepalive time. The timers should match between vendors. This is based on configuration, or negotiated behavior. 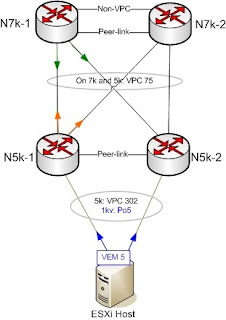 Note with Juniper SRX, BGP on the local routing device uses the smaller of either the local hold-time value or the peer’s hold-time value received in the open message as the hold time for the BGP connection between the two peers. Therefore, by setting timer on Cisco Nexus to a smaller value (10/30), it is used by SRX. To reduce convergence, the test sets Nexus keepalive to 10 seconds. This shows after successful negotiation, SRX (with a local hold time of 90) uses Nexus’s keepalive of 10 seconds, and active hold time of 30 seconds. If your network is like most large enterprise’s, chances are you have Internet connection from dual ISPs to your data center. It used to be a popular tactic to have a primary provider, and a backup provider which you pay lesser bandwidth for. In recent years, usage based circuits has given way to flat rate, often larger bandwidth circuits from both ISPs. After all, users demand more bandwidth, even in failure scenarios. Why would you pay for expensive Internet access and only letting it sitting idle most of the time? Therefore, load sharing on redundant ISP connections has become highly desirable for data centers. Since neighboring AS or AS-PATH must be equal, that means BGP can only load balance to a single AS or single ISP. 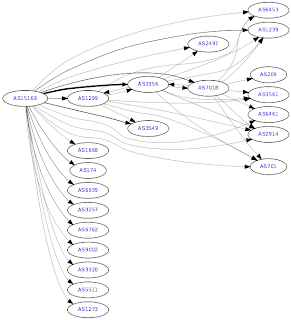 Since different ISP will have different AS and AS-PATH, BGP will only pick one best route. I don’t know why it is hidden command, since it appears to be a very useful feature, and it is supported. But do use with caution, as the number of routing entries will increase, often overwhelming the limited memory you have on the Internet router. In this year’s Networker, an alternative method was also shown, essentially separating out the Internet routing table by even and odd digits, for outbound traffic. With Nexus 5000, it is very common to select the first few available ports for basic infrastructure such as peer links and uplinks. But that may not be best practice for resiliency, due to shared use of ASIC on the switch. In short, there are 5 ASICs. Port e1/1-4 share the first ASIC, for example. If the first 4 physical port on Nexus 5000 are selected for all peer link and uplink to Nexus 7000, then loss of ASIC0 will bring down all these links at the same time. Even with the protection of VPC which can minimize loss, still not a desirable scenario. Use “show hardware internal gatos all-ports” to see port to ASIC mapping. Below shows "gat" 0 which is the ASIC number for e1/1-4. It will also show the next four ports show the next ASIC, so on so forth. 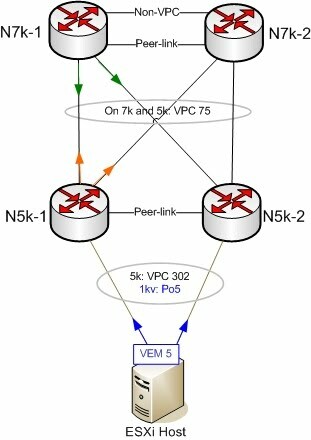 If you use dual physical ports for peer link, then definitely use two ports that are different ASICs. Why “gatos”? Here is a little humor uncovered by Colin McNamara you might enjoy. This occurred a while ago, still waiting for words. Unfortunately the condition has cleared due to production network, just wondering if anybody else out there has some possible clue about root cause. The most noticeable symptom was OSPF adjacency problem, with no error message. 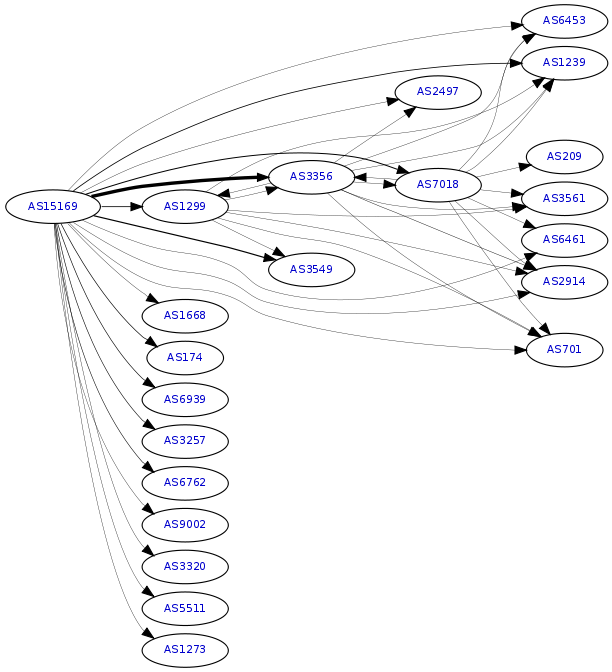 OSPF was able to establish at least partial adjacency with some neighbors, but not others. Thinking OSPF process has gone bad, we restarted it, but no use. OSPF process runs fine with no error, but adjacency trouble remains. Further review of logs reveals that a process known as MFDM (Multicast FIB Distribution?) crashed with attempted to restart three times but did not recover. Obviously OSPF adjacency uses Multicast FIB (MFIB). 2010 Aug 2 17:29:57 Nexus-7010 %SYSMGR-2-SERVICE_CRASHED: Service "mfdm" (PID 16377) hasn't caught signal 11 (core will be saved). 2010 Aug 2 17:30:03 Nexus-7010 %SYSMGR-2-SERVICE_CRASHED: Service "mfdm" (PID 16471) hasn't caught signal 11 (core will be saved). 2010 Aug 2 17:30:03 Nexus-7010 %SYSMGR-2-SERVICE_CRASHED: Service "mfdm" (PID 16524) hasn't caught signal 11 (core will be saved). We could not recover MFDM individually, end up reloading VDC to recover it. Magically, OSPF started working again! Still an open ticket, no root cause has been identified. Part of the difficulty was we seem to have lost some of the files, which makes it hard for vendor to trace it down. Just wondering is there is any similar experience out there? And, could a hardware or ASIC related failure be causing MFDM crash? Or is it more likely a software bug?